Houston Audubon's conserved lands are world-renowned nature sanctuaries for birds, other wildlife, and people. Our land holdings have grown from 17.5 acres in 1975 to 3,474 acres that span 17 sanctuaries throughout Galveston, Brazoria, Liberty, and Harris counties today. Preserving habitat through land acquisition and restoration has become an integral element of our avian conservation work. 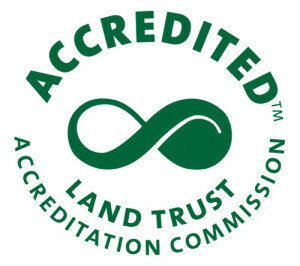 In 2013 the Board of Directors determined that applying to become an accredited land trust was a strategic investment in the long-term future of the organization. Pursuing accreditation underscores our commitment to excellence, trust, and permanence in conservation. After months of preparation and an extensive evaluation of our organizational systems, policies, and practices, Houston Audubon was awarded accreditation by the Land Trust Accreditation Commission. We are pleased to have achieved this level of distinction in our conservation work; we are now able to display the accreditation seal of excellence. We want the public, our donors, and members to have confidence that we are committed to being an effective, well run organization, now and in the future. The accreditation seal says just that. It reflects sound financial management, ethical conduct, responsible governance and lasting stewardship of the lands we've acquired. Protecting and stewarding our conserved lands in perpetuity will remain a central priority for Houston Audubon for years to come and being an accredited land trust will help strengthen our efforts. We owe special thanks to Houston Audubon's land trust accreditation committee for guiding the organization through the process and helping to prepare all the necessary documents: Skip Almoney, John Bartos, Mary Carter, Richard Gibbons, Joy Hester, Juanita Perkins, Joe Smith, and Tim White.